We've been meaning to share our skincare routine for a while, and now that we're entering one of the hottest months of summer (when skincare is most important) we thought it would be the perfect time. Using clean, natural makeup without any harsh chemicals is really important to us. Using a foundation that actually IMPROVES your skin…well that's just a dream come true ;) Working at Nordstrom, Paige tested out a ton of different foundations thanks to her friends at the makeup counter. She eventually found one that she fell in love with, and we all three now use and love it too. We use Clinique's "Even Better" Makeup as our main foundation. Not only is it free of harsh chemicals, but it actually helps IMPROVE your skin. The shade we use is "honey" but stop by any Nordstrom or makeup counter to find your perfect shade :) Click on the picture below to read more about it. After applying Clinique's "Even Better" Foundation with a brush, we blend it with a beauty blender. If you guys don't have one yet, we highly recommend it! Click on the image for the link. 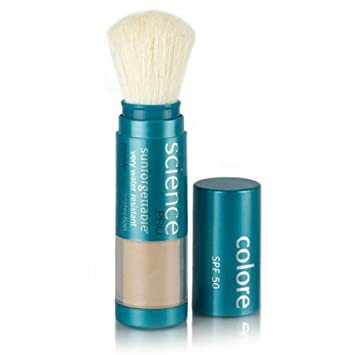 For extra protection, and to set the foundation, we use colorescience sunforgettable powder. This stuff is seriously amazing, and offers great protection from the sun all day long. Click on the picture below to read more about it. Lastly, we use a little bronzer under cheekbones to make them stand out, and sometimes a little blush (we're not big blush people, but we love "warm soul" from MAC). The bronzer and blush we use are pictured and linked below. The bronzer color is "medium deep". Sidney Shannelle Studios. Follow her on Facebook and Instagram and watch for an upcoming giveaway!